The village of Vlado Trichkov is situated about 17 km west of the city of Sofia and is the first one along the Sofia-Mezdra line in Svoge municipality. Its territory borders with the villages of Lukovo, Rebrovo, Tseretsel and the villages of Sofia Municipality. The average altitude is 744 m. Its land is about 19 sq. km. Population – 1213 people. The feast of the village is on the 6th of September. On the same date this year (2014) the community center (chitalishte) of the village – People’s Culture 1954 – celebrated its 60th anniversary. The village can be reached by bus or train. 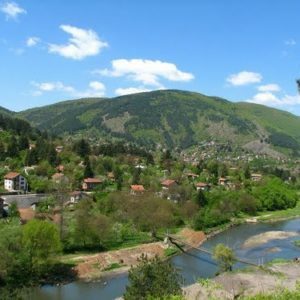 The village consists of several neighborhoods, scattered along the Iskar river gorge – Romcha (which was once a village, but now a neighborhood), Klisura, Kalugeritsa, Golyama Laka, Barata, Govedarnik, Pehchanitsa, Lazhov Rat, Oreshets. Being located on both sides of the Iskar River, the village has several rope bridge for pedestrians and a single car bridge connecting the neighborhoods on both sides. The bridge is actually the road junction for the former village and the present Romcha neighborhood. Romcha neighborhood has a church and a fair that takes place on May 6. There are still streets that are not asphalted, usually in the higher parts. In some of the villa areas there is no central water supply and the inhabitants there have their own water sources. These are predominantly the villa areas. Apart from the locals, in recent years there have been many settlers from the capital who have chosen the village life compared to the dirt in Sofia. Some of them had villa properties that are now suitable for year-round residence, others have bought such properties recently. The village has a primary school and a kindergarten, a large restaurant, several small pubs, grocery stores, a beverage store, a shop of the Aro chain and a pharmacy. Close to the kindergarten there is a small fenced football field. In one of the neighborhoods there is a small private complex with a swimming pool, horseback riding and a restaurant. There is also a car repair shop and a building materials warehouse in the village. There are many opportunities for walking around the Balkan Mountains. In good weather, off-road maniacs are often encountered with bikes that cross the mountainous areas. Almost every neighborhood has its own forest path, where local people feed their animals, and often people walk around the ridges of the mountain. For example, on a hill there is an abandoned neighborhood, with old mud-brick houses where people once lived, though without electricity and water. From the hills are revealed wonderful views of the even Sofia field. The Iskar River is suitable for fishing, which is a great fun for people with this hobby.